The Exchange Club of Augusta. How did the Club get its start? Who are the members? What does the Club do for Augusta? How did the Fair get its start? How do the proceeds from the Fair benefit our community? What other projects are the Club involved in? Where are we going from here? It was the roaring 1920s. The world war was long since over and the hardships of it forgotten. The war had continued the industrial boom from the last century, but a post-war recession had slowed things down dramatically. In the South there had been some bankruptcies of formerly strong businesses, but overall the future looked bright. The civic leaders of Augusta realized that there were needs in the community that throwing money at would not cure. Community service was required, and they wanted to give back to their community some of the benefits they had reaped. They wanted to EXCHANGE some of their spare time for the benefits of personal community service. A bright young lawyer in Augusta, William M. Lester, felt that need. He had been doing well in his practice. However, he felt that something was missing in his life. He, too, needed to give back to the community. Just as he and nine of his close friends were meeting to discuss the needs of the community, he was approached by a representative of the National Exchange Club, only recently formed in Ohio; and the match was perfect. Mr. Bill, as he was known, saw the opportunity to accomplish exactly what he wanted as a part of a national organization that had quite similar goals and objectives. This group of nine quickly expanded to 34 enthusiastic young men who wanted to EXCHANGE ideas, service, and fellowship. They were eager to exchange some of their free time for service to their community. They worked together quickly that summer of 1923 and on August 8, the charter was presented to the Exchange Club of Augusta in a ceremony headlined by the Augusta Chronicle. The affair was hosted by the Chamber of Commerce and the other civic clubs in the City. Mayor Julian Smith gave the welcome address. Mr. Lester had been named president and responded to the granting of the charter by stating, “It is our purpose to accomplish something worthwhile for our city, our state, and our country…. We want to help the boys and girls of Augusta and the delinquent and neglected child.” Almost as soon as the charter was accepted, the club began to take on a huge project. The Savannah Valley Association of Agricultural Clubs had appealed for financial support all over the community, and finally decided to abandon its plans for a Fall Agricultural Fair. 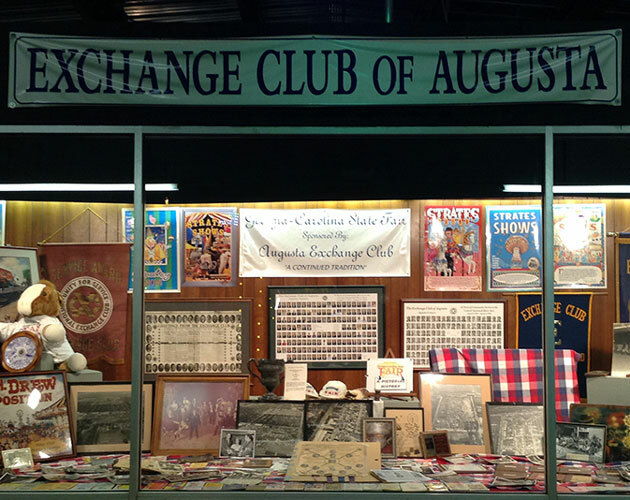 On October 3, 1923, the Exchange Club met and voted to take on the Fair as a project. By October 11, the Club announced that the famous Johnny J. Jones Exposition Company was coming to Augusta for one week, November 12th to the 19th. A site was chosen by the carnival on the corner of 15th Street and what is now known as Laney-Walker Blvd. It would host the carnival nicely, but the Exchangites quickly began to expand the plans and more space was needed. A poultry show was added, followed by a Miss Augusta pageant, and a Baby Show. Fifty-seven babies had been entered by October 25th and by opening day there were more than 700. There were 47 young ladies in the Miss Augusta Pageant. The Fair was to open with a parade with four bands, 25 business floats, 20 fraternal order floats, and numerous military organizations. A crowd of over 25,000 persons lined Broad Street to see this grand parade which ended at a newly chosen site for the Fair at the lower end of Greene Street. Each day of the Fair was dedicated to a different theme, such as Merchants, Farmers, Children, Augusta, and Everyone. The entire production was a smashing success, especially considering it was taken from being merely an idea to becoming a huge production, all within the span of six weeks. The Fair continued to expand its operations, and in 1937, the Club negotiated with the Board of Trustees of the Academy of Richmond County for the purchase of 18 acres between 3rd and 4th Streets running from Hale Street on the North to Laney-Walker Blvd. on the South. This would become the new site for the Fair and is its location till this day. Because the Fair and Club had grown to serve a much expanded community – The Central Savannah River Area (CSRA) covering numerous communities in Georgia and South Carolina – in 2001, the membership saw the need to change the name of the Fair. They chose the Georgia Carolina State Fair to better represent the community that it served. As soon as the Fair was over, the members of the Club began deciding how to divide the funds they had raised. There were always so many worthy organizations, and so much need in the community. Requests for funds always exceeded the funds available; so priorities had to be set. Going back to their beginnings, the members took the position that children came first. Donations to Girl and Boy Scouts, Girls and Boys Clubs, Future Farmers and Future Homemakers of America, 4-H Clubs, and scholarships to local colleges and universities, came first on the list; and it is noted that these donations to youth-related organizations were in addition to the prizes that so many young people had taken home with them from various competitions at the Fair itself. In addition to these organizations and in keeping with the National Exchange Club’s dominate project, The Prevention of Child Abuse, the Club now contributes largely to organizations dedicated to this worthy cause. Presenting Freedom Shrines to local institutions. This is especially important, as it shows that the Club represents itself to the community as an organization based on strong family values. The Freedom Shrine collection of documents from the history of the United States, beginning with the Mayflower Compact, and including the Declaration of Independence and the Constitution, strongly supports the idea that the strength of this nation lies in the strength of its families. The structure of the leadership of the Club and the method of selecting the leaders has been another blessing to. The Board of Directors is composed of six Officers and six Directors, and these are elected annually by the full membership. The officers are the President, the First Vice-President, the Second Vice-President, the Secretary, the Treasurer, and the Immediate Past President. Only the Secretary and the Treasurer are allowed to succeed themselves, and only for a total of five terms. No Director can succeed himself. So, the usual progression is for someone to be elected as 2nd VP, then the next year elected as 1st VP, then the next year as President. He would serve on the Board each of these years, learning as he went. Then, he would serve on the Board as Immediate Past President, lending his experience to the Board, but no longer in charge. It is clear that the Presidency of the Club seeks the man; the man does not seek the Presidency. Except for the first few years after the Club was formed, a Past President of the Club has never been allowed to again serve as President. While this may seems like a waste of talent, it has proven to be a wise move over the years. Instead of allowing the Club to be governed by a small group of people, the leadership changes each year and looks for talent from the whole membership. In fact the Bylaws now prohibit a Past President from ever again serving as an officer of the Club. However, Past Presidents are often appointed to chair important committees, and are regularly called upon for advice. This allows for use of the wisdom of Past Presidents without having them impose their sometimes “old fashioned” ideas upon the current leadership of the Club. For the Club to move forward, it is necessary for new ideas and new enthusiasm to come to the leadership of the Club each year. This has been a major factor in keeping the Club moving forward through good and bad times. The Augusta Exchange Club is not only active in the communities surrounding Augusta, but reaches out nationally as eight members have served as State or District Presidents and one member (Millard Beckum) served as National President and as National Treasurer. While the Club has continually supported many local and national charities through donations of the funds raised at the Fair, in the early 1960s the Club decided to take one of its favorite projects and make it a very significant part of its being. Mr. Lester had been nominated by the National Exchange Club to receive one of its most prestigious awards, but in order to accept it, the Club must put up $1,000 to pay for the award and the ceremony. Mr. Bill was quick to say that he would have no part of it, as he would rather have the money go toward a scholarship for some local child in need. Since the Club had been making scholarship grants from time to time in the past, it thought that this would be a great opportunity for them to honor Mr. Bill and at the same time set up a fund to continue to give scholarships to needy students. It did so by forming the William M. Lester Scholarship Fund, and over the next thirty-plus years, contributed over $1,000,000 to scholarships to more than 800 local students at Augusta State University, Paine College, Medical College of Georgia, and USC–Aiken. The Club’s emphasis on youth and helping them become solid citizens has paid off time and time again, as so many of these students went on to become truly productive members of society. In the early 1990s when the Fair business seemed to be on the wane and the funds from the Fair began to drop significantly, the Club wanted to make sure it was able to continue to contribute to the many worthwhile charities in the community. In 1996, the Board, under the leadership of President Clyde Lester, decided that it was necessary to set up a separate nonprofit organization, to be known as the Augusta Exchange Club Charity Fund, into which it could contribute each year, so that the principal would be held and grow, and the income could be distributed annually to various charities. This Fund was formed, and the members of the Club, as well as many outsiders, graciously began making contributions to it, in addition to the funds which the Club itself contributed. Members used any opportunity to honor another member by making a contribution to the Charity Fund, and the Fund quickly grew. Everyone agrees that, over the years, it has the potential to be of significant benefit to the charities in this community.